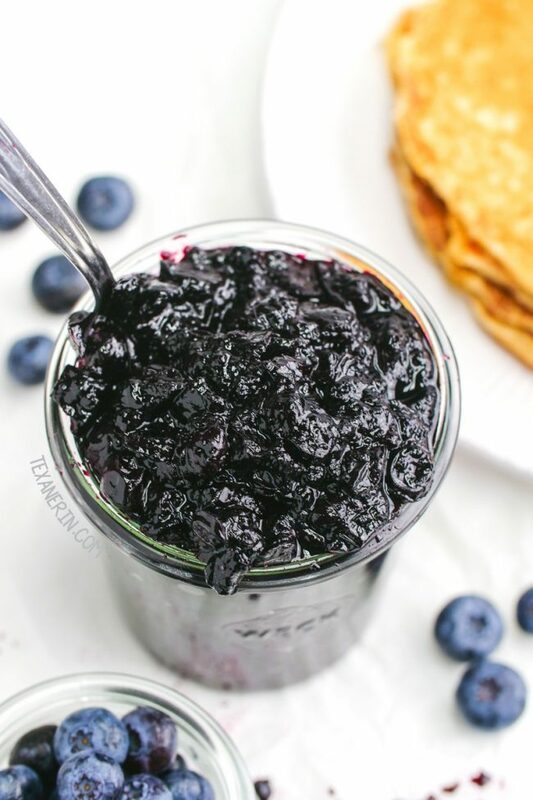 Super quick, easy and healthy blueberry sauce that’s perfect over pancakes or cheesecake! It’s only three ingredients and sweetened with maple syrup, making it naturally paleo and vegan. Bloggers are already posting pumpkin recipes, which to me is an October thing, but I’m still loving the summer fruit that will soon be gone. If you’re with me, this recipe’s for you! Blueberries were on super sale last week. And when berries are on sale, I strike. They were taking up too much room in my fridge so I had to find a way to use some of them up quickly. I keep seeing blueberry syrup during “American week” at the grocery stores here, and although I love the idea of blueberry syrup, I don’t love the idea of sugar + fake blueberry flavoring. I use this blueberry sauce with these whole grain pancakes for two and it’s also great on this gluten-free cheesecake. All you do is simmer the maple syrup and blueberries for 15 minutes. That’s it. Add some vanilla and salt and you’re done! No straining and no fussy methods. You can tell by the pictures that it’s pretty thick. If you enjoy it right after making it, it’s thinner and easier to pour over pancakes. It thickens a bit as it sits but can be reheated to make it more runny. You can also use an immersion blender or a blender to puree half of the sauce to make it even more pourable. So the next time you want to make something special and you need to do it quickly, here you go! For another maple-sweetened blueberry treat, try this paleo blueberry crisp or this Swedish blueberry soup. 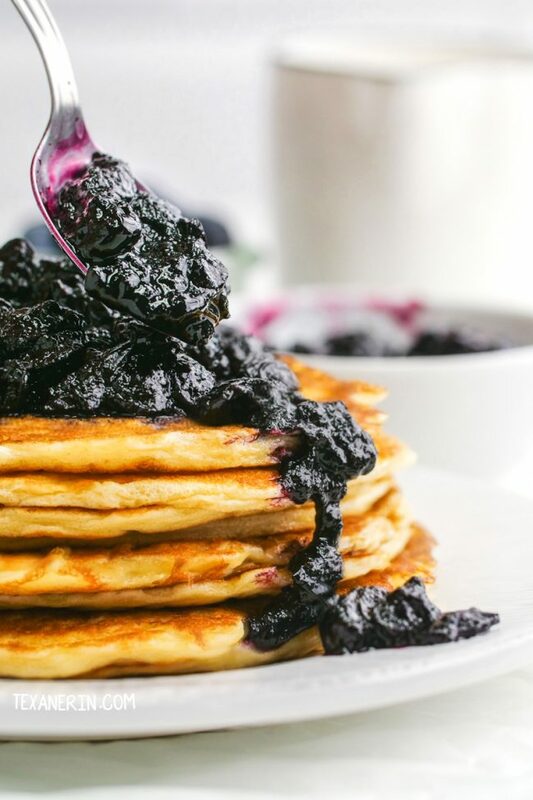 I imagine this blueberry sauce recipe would work with other types of fruit but I can’t think of any that go as well with maple syrup as blueberries do. If you’re wanting to try a raspberry version, this raspberry sauce really sounds tasty! And if you want to use another liquid sweetener, I think that’d be fine. If you use a granulated sweetener, I’m thinking you’d have more of a jam than a sauce. Hope you enjoy those final days of summer. :) And if you’re looking for a recipe to put this sauce on, these keto pancakes would be great! In a medium saucepan, cook the blueberries and maple syrup over medium heat. The blueberries will pop and get very soft, so be careful with stirring. Stir every now and then, cooking about 10-15 minutes, until the sauce has thickened. Stir in the vanilla and salt. Let cool for 5 minutes before serving. It'll firm up like jam once cooled, so reheat, if desired. Store in the fridge and reheat before serving. Keeps up to 1 week. Can also be frozen for a few months. 17 comments on “Blueberry Sauce (paleo, vegan)” — Add one! 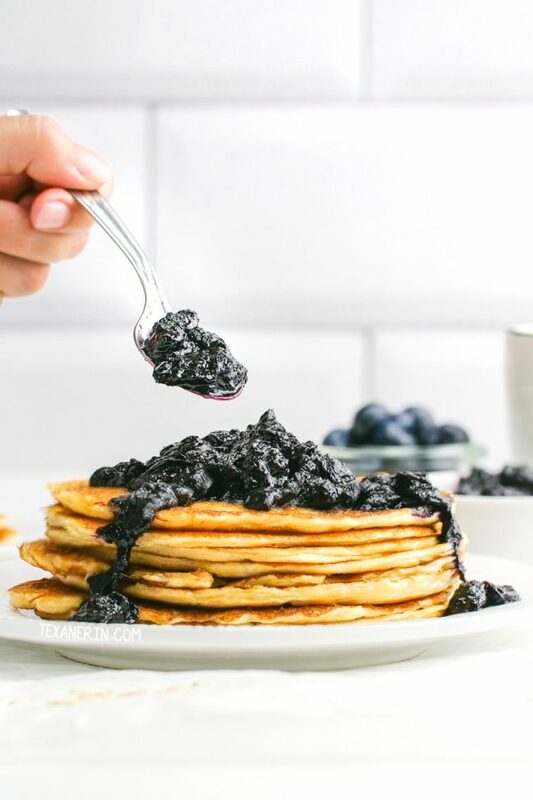 This looks so dreamy…I just love blueberries and this over pancakes! Wow! Can’t wait to give it a try with fresh berries this summer! Now this is breakfast! I have to try these! This fresh blueberry sauce is like summer in a jar! So delicious! Yum!! So easy and can be used so many ways! 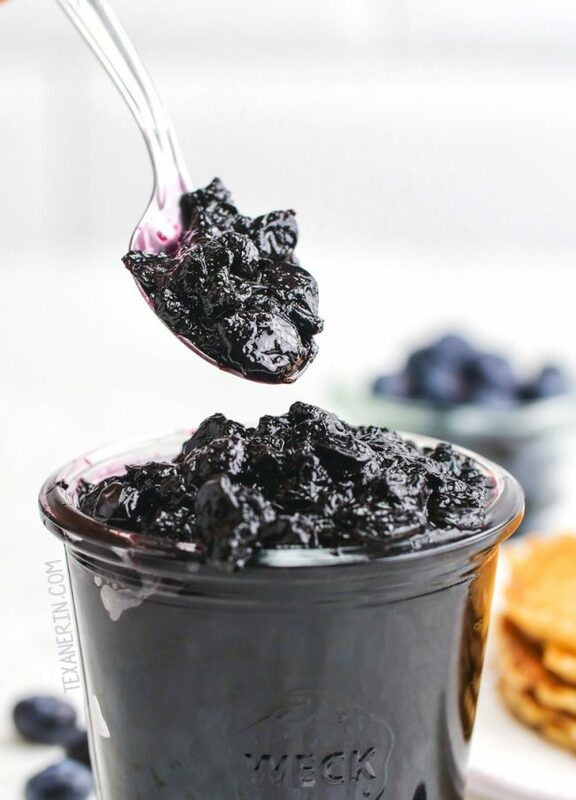 This blueberry sauce sounds fantastic!! I will definitely be making this!! Oh my! That looks so tender. This is really very tasty! Perfectly! Thanks for the recipe! I want to try it! Sounds delicious! I cannot wait to try this out! Is looks amazing! What is the shelf life in the fridge? Thanks! And sorry for not including that. I just fixed the recipe! It keeps in the fridge for a week and after that, I freeze it.